Regardless of the type of work you do, quality footwear is a must-have. Great work boots are essential for staying safe and protected. Unfortunately, boots don’t do much to improve comfort. To ensure that your body doesn’t feel the effects of a hard day’s work once you’re off the clock, invest in a pair of high-quality insoles. Insoles are placed in the bottom of the work boot directly under your feet. They’re designed to support your feet while reducing the force of impact on your joints. Insoles can dramatically reduce fatigue in your feet, legs, and lower back. 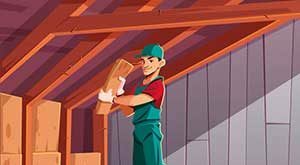 They can help improve your work performance, keep you comfortable, and help prevent any lasting injuries. The market is flooded with insoles. They come in a variety of designs and materials to suit specific needs. To help you get started on your search for the perfect insoles, here are 7 of the best insoles for work shoes and boots. 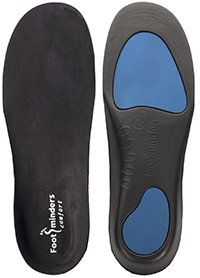 These insoles from Footminders combine the best features of comfort and support insoles into a single product. They’re designed by podiatrists to relieve foot pain and help treat conditions like Plantar Fasciitis. Most of the insoles are firm. The tough black material provides adequate arch support and stability. It can help align the feet and help fix pronation issues. However, a softer gel is included in the heels and balls of the feet. This helps to provide all day comfort. The materials are covered by a microfiber material that’s easy to clean and maintain. The insoles are available in a range of sizes to get a custom fit. From Timberland is this unique pair of insoles. They contain anti-fatigue technology that absorbs shock and transfers energy. 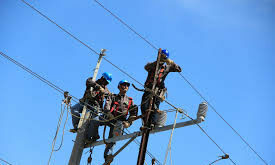 This process is done through unique cones that compress and rebound with every step. 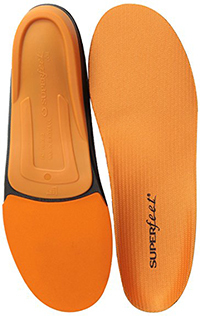 The insoles are made from a tough synthetic material. They’re covered by an OrthoLite layer. This layer keeps your foot cool and prevents odor with its antimicrobial technology. For support, the insoles are anatomically contoured. This contour cradles the foot in all the right places to provide maximum support and comfort. The arch support can adapt to all foot shapes and sizes. 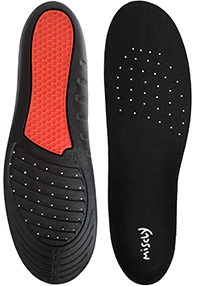 These insoles utilize four separate layers to provide you with support and comfort. Two layers are dedicated to cushioning your foot with every step. The two layers are made from EVA foam cushion. Between these layers is durable arch support. 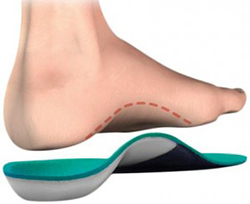 The insoles are designed to cradle and protect the foot from impact. On top of these layers is a comfortable fabric. It’s antimicrobial and built to reduce heat and friction as you walk. As a result, the feet stay fresh and bacteria free. As a whole, the insoles are rigid enough to keep you stable throughout the day but flexible enough to provide comfort and versatility. From New Balance, these insoles are designed to mold to your feet and provide you with a custom fit. They’re very versatile and can be used with a variety of different shoes. They can also help provide relief from a number of ailments, including diabetic pain. 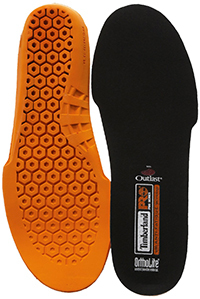 The insoles are made from a synthetic material and have a unique Plastazote top cover. Cushioning underneath absorbs the shock felt in the heels and forefoot. To provide further relief, the insoles have anatomical arch support and heel cradle that works to distribute pressure evenly throughout the foot. If you’re looking for a custom fit without breaking the bank, these insoles are a great option. They’re relatively thin and firm to provide you with support where you need it most. A unique feature of the insoles is that they’re heat moldable. They can be shaped to fit your feet exactly. When they’re hot, the synthetic material becomes pliable enough to shape. Simply stick it in the boot, put it on, and let the insole cool to ensure that it retains the shape. Despite having a custom fit, the insoles are designed to have excellent support for the arches. With multiple layers of different materials, these insoles provide you with the features you need to stay comfortable and safe. A gel honeycomb layer absorbs shock and increases comfort. An additional layer of PU foam helps to reduce fatigue throughout the day. There’s also a rigid layer that stabilizes the heel and arch. It has an ergonomic design that moves with the contours of your foot. This unique design coupled with the deep heel places your foot in the right position as you move. An anti-slip polyester top layer also helps to keep you dry with ventilation holes and antimicrobial properties. It also reduces friction to prevent painful blisters. These insoles have features in the forefoot and heel to provide better stability regardless of the activity you’re doing. The heel is deep and contoured to absorb shock. There’s also a reinforced stabilizer cap for added support. Closed-cell foam runs the entire length of the insole for comfort throughout the day. To reduce stress on the feet, ankles, and knees, the insoles are contoured and quite thin compared to other options. On the front of the foot is high impact foam. It absorbs shock and reduces the effects of moving on a hard surface. The insoles also have an organic coating that prevents the growth of bacteria and odor. All shoes typically have an insole already built in. Depending on the manufacturer, the insole may have significant cushion and arch support to help improve fit and comfort. However, these insoles aren’t made to provide you with personalized relief. Furthermore, built-in insoles are notorious for their low durability. This is especially true in work boots. High-quality insoles can provide you with a number of great benefits that stock insoles just don’t have. Some of their biggest benefits are increased comfort and less fatigue. That extra cushion and support can do wonders throughout the end of the day. They also have more shock absorption. Your feet, legs, and lower back will experience less pressure, allowing you to stay energized and ready to work for much longer. Additional benefits include a better fit, fewer blisters, and reduced sweating. As a whole, insoles improve the work experience. Regardless of the type of insoles you go with, you’ll have a noticeable improvement compared to stock insoles. If you choose insoles that are catered to your specific needs and work activity, you’re better equipped to stay safe and comfortable regardless of what work throws at you. 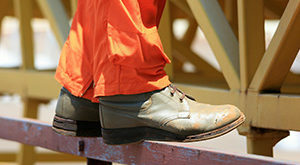 They’re a small investment that can dramatically improve the performance of your work shoes. While most don’t realize it, there are actually a few different types of insoles available on the market. The key to an effective pair of insoles is to choose an option that works for your needs. Choosing which type of insole works bests starts by distinguishing between these three types. If you’re looking for insoles that will help you throughout the work day, it’s best to avoid comfort insoles. As the name implies, they’re designed for providing comfort and nothing else. Typically made from thick gel or foam, they provide a ton of cushion to keep you comfortable as you walk around. While they’re great for walking, they don’t provide much in terms of stability and support. They can actually make workplace activities a bit more dangerous. 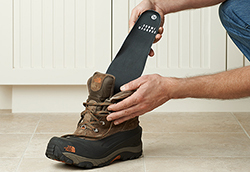 Support insoles are great for work because they provide comfort by improving support. They don’t use cushions or padding to increase comfort. Instead, they alter the position of the foot and the way it moves at you take a step. They utilize harder materials to support the foot at different areas. They’re great for helping with conditions like Plantar Fasciitis, misalignment, over-pronation, supination, and much more. These types of insoles are the most personalized to your needs because they’re made by a Podiatrist. They’re designed to tackle serious conditions. Some common conditions include fallen arches and flat feet. Insoles won’t provide you with benefits unless they’re fitted correctly. 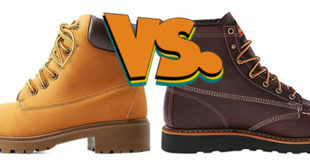 It’s important to start with a work boot or shoe that fits you snug. Insoles can affect the volume inside your boot, so it’s important to find an option that’s close to the same thickness as the insole that came in your boot. Stock insoles typically aren’t glued onto shoes. They can easily be removed by sticking your hand inside the shoe and lifting the insole out. 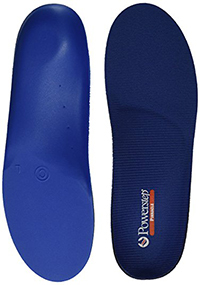 Use this insole as a size and thickness reference. Once that’s taken care of, it’s time to fit the insole. Start off with the insole on the ground. Step onto the insole with one foot. Lift the other foot off the ground and try to stay balanced. A good insole will cup your arches and provide you with the support and stability you need to stay upright. Ensure that the insoles feel comfortable from the heel to the ball of the foot. Next, use the stock insole of your boot to cut it to size. It’s a good idea to first cut the edges of the insole so that they’re one size above your shoe. Simply slip it into the bottom of the foot to see if it fits. It takes some trial and error, but the extra time is well worth it. Once it fits inside the boot, put the shoe on and pay attention to the fit. You should still feel the same amount of support as you did when the insole wasn’t in the shoe. Pay attention to the pressure of the boot with the insole. You can make fine adjustments to get it feeling perfect. If it doesn’t feel right, you may need to find a different size. Insoles are quite easy to take care. They should be removed after each use. 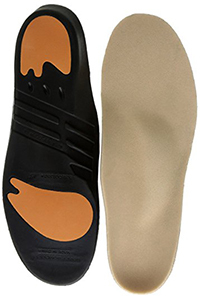 This allows any excess moisture to evaporate and helps to keep the insoles odor free. Furthermore, this gives you the opportunity to inspect them. Look out for any signs of wear. Damaged insoles serve you no purpose, so they should be replaced whenever they’re starting to become damaged. It’s also good to wash them every once in a while with a mild detergent. Just give them a thorough cleaning in the sink and let them air dry. 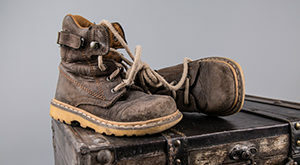 With this information in mind, finding the right pair of insoles for your work boots shouldn’t be a problem. It’s important to take time in finding a quality pair that works with your unique needs and workplace environment. At the end of the day, you’ll notice the difference a pair of great insoles can make in terms of comfort and fatigue.